(Nanowerk Spotlight) Contouring measurement methods are important for high quality, high speed and productivity machining in order to achieve the high precision required. Among the most commonly used methods, no measuring techniques have been available with nanometer resolution except for the grating encoder measurement system. In our recent report we present a nano contouring measurement method that mainly uses the characteristics of high accuracy and high stability of a laser interferometer in conjunction with a different method of lens arrangements to achieve the goal of multiple axes measurements. The measuring methods developed in our paper ("New nano-contouring measurement techniques for a nano-stage", published in the June, 2006 edition of Machine Tools & Manufacture) can be divided into two architectures. The first measuring architecture is named 1L2RV (one laser head and two external receivers vertically); the second is 2L0RV (one laser head and no external receivers vertically). Nano contouring measure system 1 is mainly characterized by placing the beam splitter on the stage to be measured, but not using the commonly used method whereby the deflector is placed on the stage to be measured. 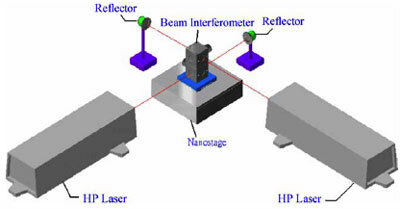 As for its measurement method, a He-Ne laser (HP5519A) first lets its light source be split by the beam splitter, then measures the movement conditions of the nano-stage against the X axis and Y axis respectively. The He-Ne emits a laser beam, which goes directly through a reflector and splits into 2 rays of lights, one of which directly shoots into the beam splitter on the stage to be measured. The other laser light shoots perpendicularly into another reflector in the axial direction through two 90° reflectors. 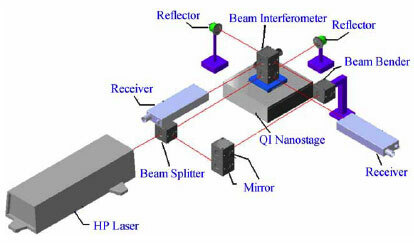 The laser light then shoots directly into the other beam splitter on the stage to be measured and measures its axial direction. At the end, the two interferometer processors receive the signal storage of the X axis and Y axis via the two receivers. Using this method, not only is the performance of the nano-stage made known, but also the displacement and interference of the X axis or Y axis can be measured simultaneously. Nano contouring measure system 2 is mainly characterized by placing the beam splitter on the stage to be measured. It is different from method 1 in that 2 He-Ne lasers (HP5519A) are used for measurement, whereby the two light sources pass through the beam splitter to directly measure the movement conditions of the nano-stage against the X axis and Y axis. The two laser light sources receive the signal storage of the X axis and Y axis via the two receivers, then use computers to process the signals for the 2 pieces of information. Using this method, not only is the performance of the nano-stage made known, but also the extent of displacement and interference of the X axis or Y axis may be measured simultaneously. By Chair Professor Wen-Yuh Jywe, Department of Automatic Engineering, National Formosa University, Huwei, Taiwan, ROC.